7TH GRADE A TEAM VOLLEYBALL DESTROYS WOODRIDGE FOREST IN TWO!!! Our A Team Lady Bears were pumped as they began their match up against Woodridge Forest. Right off the bat, Chloe Richards started us off by serving an Ace for the first point. Allie Ebbeler played great defense and had two point scoring blocks at the net! Hadley Kelly showed excellent hustle with multiple saves all around the court and Jenna Shaffer’s jump serves were out of this world! Chloe Richards sealed the first game 25-9, with an amazing Ace! Leah Hammack was the ultimate all-star in game 2 for our Lady Bears! 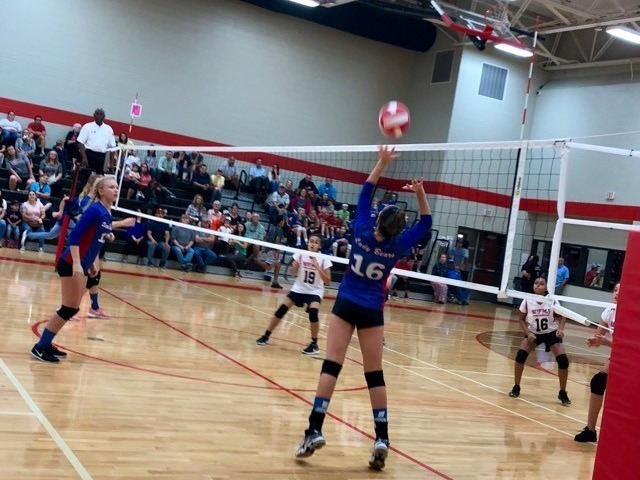 She scored 16 points off of serves alone, including 4 aces! WOW!! Haley Baird had a HUGE first successful serve, Hannah Avila had a great set, and Alli Gentry showed off her skills with two great kills! Camrynn Payne had two marvelous saves on the front line and sealed the game 25-6, with an Ace to bring the Lady Bears home the Win! 7A LADY BEARS FINISH SEASON WITH A WIN!